Visual Studio 2012, a family of products, tools, and technologies that you can use to build powerful, high-performance apps. You can use Visual Studio 2012 to create Windows Store apps, in addition to desktop, web, phone, and game-console apps, in this release of Visual Studio. 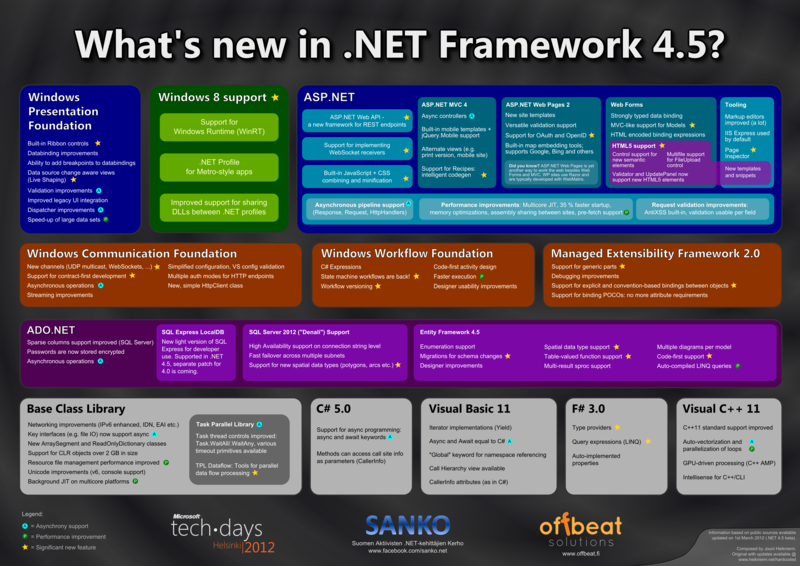 Visual Studio 2012 introduced .NET Framework 4.5. The .NET Framework is a development platform for building apps for Windows, Windows Phone, Windows Server, and Windows Azure. It consists of the common language runtime (CLR) and the .NET Framework class library, which includes classes, interfaces, and value types that support an extensive range of technologies. The .NET Framework provides a managed execution environment, simplified development and deployment, and integration with a variety of programming languages, including Visual Basic and Visual C#. Installation.NET Framework 4.5 does not support Windows XP or Windows Server 2003, and therefore, if you have to create applications that target these operating systems, you will need to stay with .NET Framework 4.0. In contrast, Windows 8 and Windows Server 2012 in all of their editions include .NET Framework 4.5.